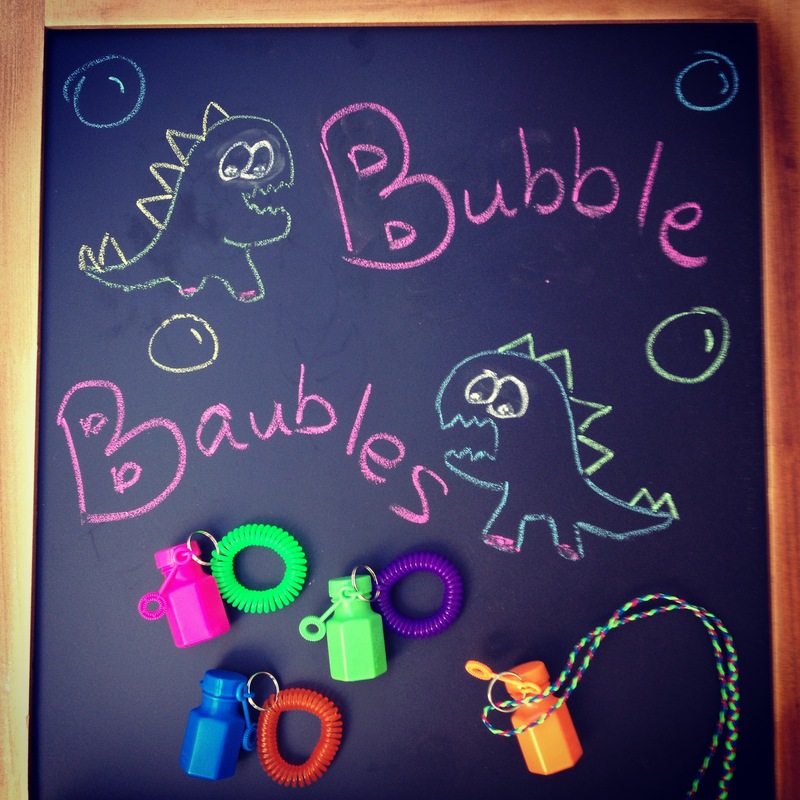 Bubbles are a great way to celebrate summer, but if you’ve been around kids, you know that they can be quite a mess. In fact, spilling the economy sized bubble solution bottle is just another childhood right of passage somewhere between dropping your ice cream cone and falling off your bike. Now this hack may not solve all of your spilling troubles, but it will lessen the mess! It’s basically as if the brilliant folks behind the Spritz line at Target contacted Wayne Szalinski and commandeered his shrink ray to create the perfect sized bubble pots to have just enough fun. (Bonus points if you get my 90s movie reference!) But why stop there? To make these bubbles even more accessible, I decided to turn them into wearables. That’s right! Bracelets and necklaces allowing the fun to be taken anywhere and used in a flash. The wrist coils were the easiest, of course, because they come with split rings (think keychain hardware). If you do decided to go the split ring route, be sure to connect the split ring on the *other* side of the bubble wand (not where the plastic splits a bit to allow removal of the wand). If not, you run the risk of the split ring slipping out of that space and the bubble pot dropping off. To make the necklace, I simply braided 6 strands (each color folded over and held together to double) of stretch cord in bright colors. You could really make a necklace out of anything: embroidery floss (friendship bracelet style), plastic lacing (gimp style), yarn, thread, elastic… you catch my drift! At around 17 cents per bubble pot and 50 cents per wrist coil, the bracelets make a fantastically affordable party favor or play activity. If you choose to go the necklace route, you may be looking at even less expense! Please remember that all children should be supervised with any toy that can be worn, particularly around the neck. You may want to consider break away closures when creating necklaces for little ones. Also, due to the itty bitty nature of the wands, these particular bubble pots should only be used by children ages 3+. Go forth and blow those round rainbows! 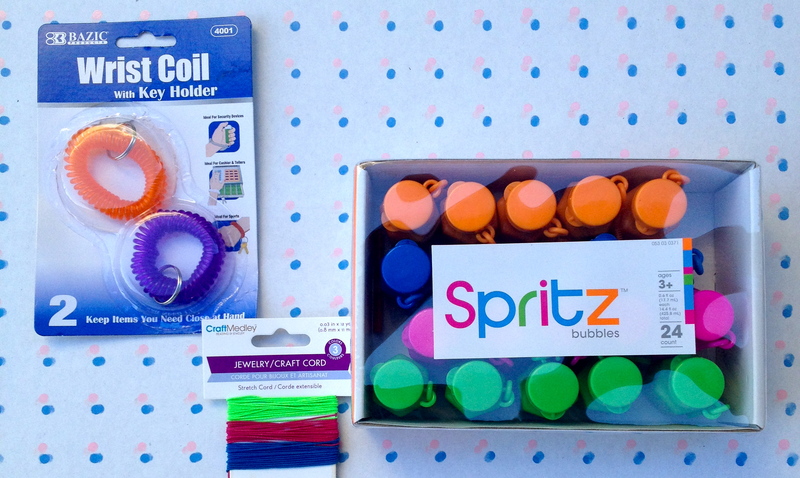 Tags: activity, affordable, birthday, bright, bubbles, children, color, dollar, favors, fun, jewelry, kids, party, playtime, spritz, store, summer, target. Bookmark the permalink.